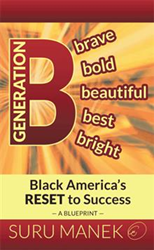 New Marketing Push for ‘Generation B,’ Guidebook Against Inequality. Author Suru Manek’s guidebook offers proposals to alleviate black America’s economic plight. Suru Manek has witnessed the socioeconomic plight of African-Americans, as well as the proverbial laundry list of racism, violence, poverty and the myriad of issues brought to the forefront by the Black Lives Matter movement. He says that these reminded him of the adversities his own ethnicity faced, which inspired him to write “Generation B” (published by Xlibris). In its pages, he proposes a roadmap to prosperity based on his personal experiences with overcoming hardship and racial discrimination, as well as lessons drawn from his Gujarati culture. Suru Manek, successful business owner and long-time president of the Lohana Community of Los Angeles, is of East Indian ancestry. Growing up in abject poverty in rural Kenya, Manek experienced extreme racial discrimination at the hands of the British colonial government. He vowed to never be victimized, staying true to his Gujarati heritage of deep spiritual commitment, strong family ties, and an entrepreneurial spirit that has never failed him. He was named the 2014 Raghuvanshi, the International Lohana Person of the Year, for his work in the fields of religion, culture and education and reaching out to other communities in the Los Angeles area.